I woke up that morning to the sound of water gently lapping the walls. I closed my eyes more tightly, trying to remember where I was. You know that disoriented feeling when you’ve woken up someplace other than your own bed, but you can’t recall exactly where that “someplace else” might be? I knew that feeling well now. 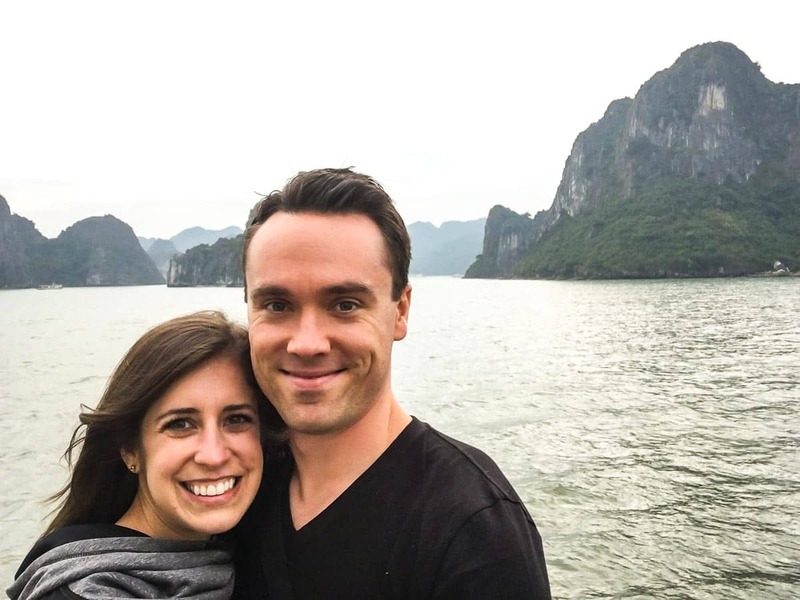 We’d been in a different city every night for two weeks, and…HA LONG BAY, VIETNAM. Our location rushed back to me. My eyes snapped open. I quickly pulled my hoodie on over my tussled hair and rushed to the boat’s upper deck. It was early, but the sun was already bright above the bay. Rocks and cliffs jutted out of the water at odd intervals, giving the entire landscape an otherworldly, almost prehistoric feel. I squinted into the distance, half expecting to see a dinosaur sunning himself on a cliff. What I saw instead were dozens and dozens of tourists boats exactly like ours. They were at short distance and becoming increasingly visible through the haze, which I was beginning to suspect wasn’t early morning fog so much as dregs of pollution. This, Ha Long Bay, was why we had come to Vietnam. 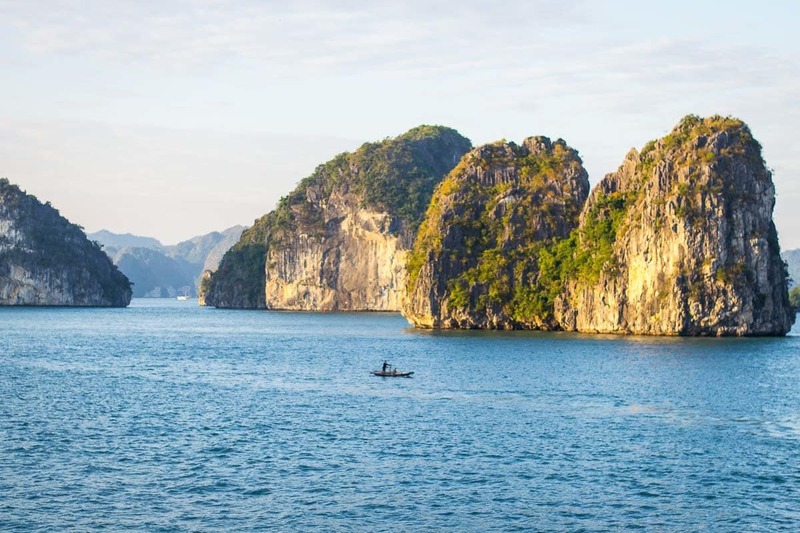 Do a quick Google image search for it, and you’ll understand why: piercing turquoise waters, shining cliffs, an endless clear sky—that’s what Ha Long Bay promised. 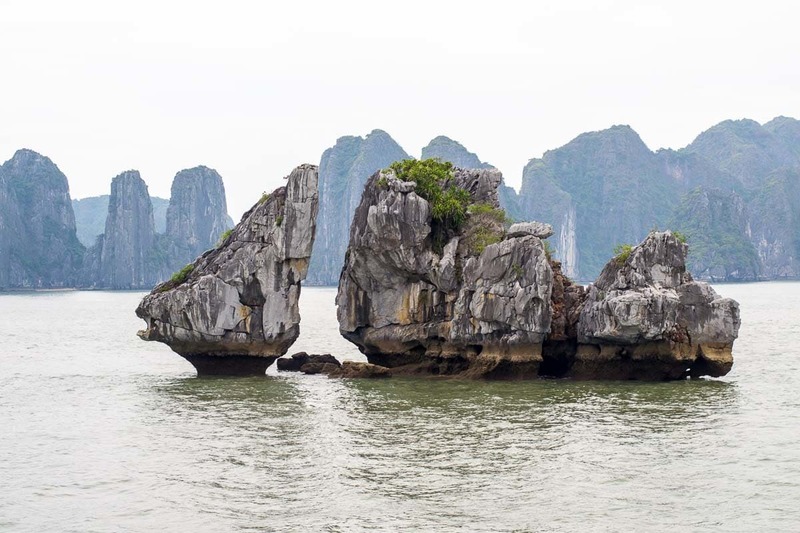 Although we enjoyed the experience enough, Ha Long Bay ended up being our least favorite part of the trip. It was quite an ordeal to make it out there (2 days of traveling), and the views were compromised enough not to feel 100% worth it. Vietnam as a whole, however, was a completely different tale. 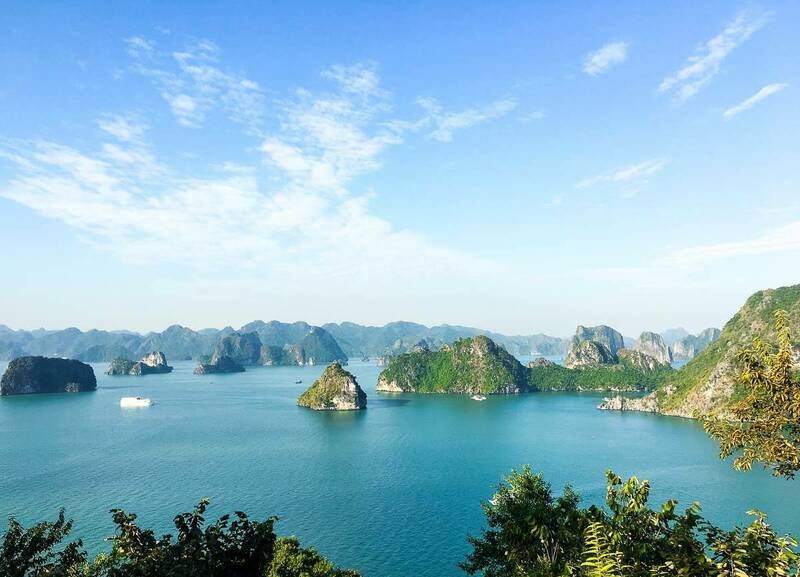 We’d chosen Vietnam for the second leg of our journey primarily because it came as a packaged deal with Ha Long Bay. We didn’t expect it to be the country we’d miss most. In keeping with the theme of the rest of our trip, Vietnam was full of surprises. Even though I adored Thailand (both Part 1 and Part 2), I didn’t leave that country with an immediate need to return. Vietnam? I’d book my plane ticket tomorrow. It’s hard for me to articulate what exactly about Vietnam captivated me so deeply. It’s not that its people were friendlier than in Thailand (people are very friendly in both places), that they spoke more English (they actually speak noticeably less), or that I preferred the food (I ate my noodle-loving heart out in both places); Vietnam, at least the sample of it that I experienced, just felt more…real. 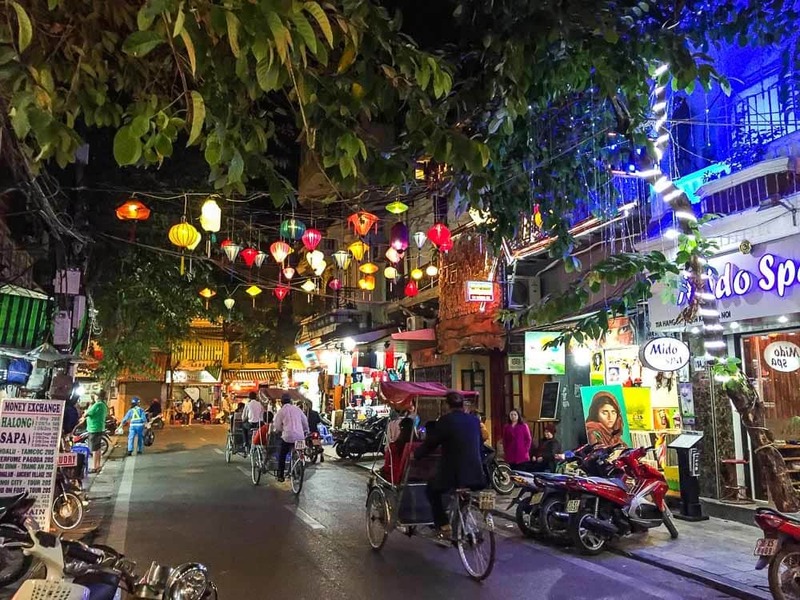 We spent time in only two cities—Hanoi and Ho Chi Minh City (Saigon)—and did one overnight trip to a tiny village along the Mekong River. The time wasn’t enough. 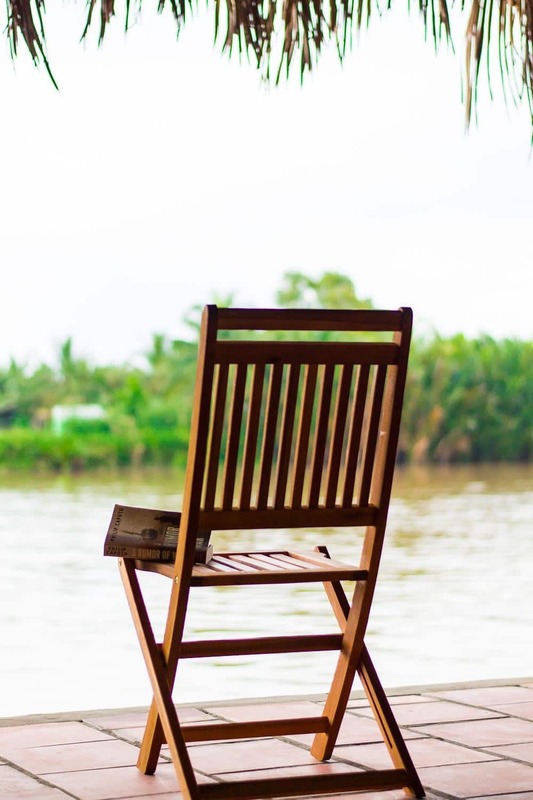 The cities, Hanoi and Ho Chi Minh City, fascinated me with their blend of Western culture, Vietnamese tradition, and complete chaos, and the Mekong River Delta was a place of peace and local life. In place of the backpacker outposts we found in Chiang Mai, Vietnam offered a less-spoiled look at a people and culture on rapid economic rise. It catered to tourists, without compromising its own order (or lack thereof, depending upon your attitude). If you are at all interested in Vietnam, I urge you, go now. The change has already arrived, and while I’m happy for the Vietnamese and the way their country is developing, I know the influx of tourists will change it too. Hanoi is a circus. Motorbikes, ladies selling baguettes from giant baskets, short tables filled with people eating, eating, eating, improvised fruit carts staffed by women slicing enormous jackfruits, kids on their way to school, bicycles, and more pack every square inch of the old city, and I’m only talking about the sidewalk. The actual street? Forget about it. To cross a street in Hanoi, approach the curb. Ignore the rushing current of motorbikes flowing towards you. Make eye contact with the driver of the bike closest to you then…walk. The motorbike will slow as you pass, then immediately accelerate as soon as you’ve cleared its path. Keep walking, shifting your eye contact to the next driver, then the next, then the next, on across the street. The motorbikes directly in front of and behind you will continue to accelerate, but if your pace is steady and your heart fearless, they will not hit you. Crosswalk? What’s a crosswalk? To find something to buy in the old quarter, you first need to locate the proper street. You also need to be specific. The old quarter is essentially an enormous market, where competitors rent shops side by side. Need a bra? Go to the clothing street and find the three bra shops selling…bras. And only bras. How about a new cake pan? That’s the kitchen street. At the cake pan store. A zipper? Three shops down from the bras, there are four stores selling zippers in every hue of the rainbow. Hungry? Not for long. Pick a place that’s serving something that looks good, then hold up your fingers to demonstrate the number of orders you’d like. Unless it’s a nicer sit-down restaurant, most restaurants only serve one dish, which you can identify either by the restaurant’s name (most are named for the dish they serve, followed by their address), or simply look at what everyone seated at the low tables placed outside the restaurant is eating. Hanoi can be maddening at first, but if you give way to its rhythm, if you spend your time piecing together not if it works but how it works, I solemnly believe it will steal your heart as it did ours. Café Pho Co. Your mandatory order: EGG COFFEE. It’s a specialty of Hanoi, and despite its odd name, it is outstanding and unlike anything I’ve ever tried. I became so obsessed, we went to three different coffee shops in less than 24 hours. Café Pho Co had both the best view and my favorite rendition. For the curious: based on my research to determine how exactly I could replicate this nectar of the gods at home, egg coffee is rich Vietnamese coffee smothered in a thick, foamy layer of sweetened condensed milk whipped with egg yolks and magic. Go to Hanoi, order it for yourself, and see if you agree. Don’t like sweetened coffee? Me neither, and I still couldn’t get enough! Hỏa Lò Prison. A little creepy, but very interesting. Walk the French Quarter. The French colonial influence makes for some beautiful buildings. 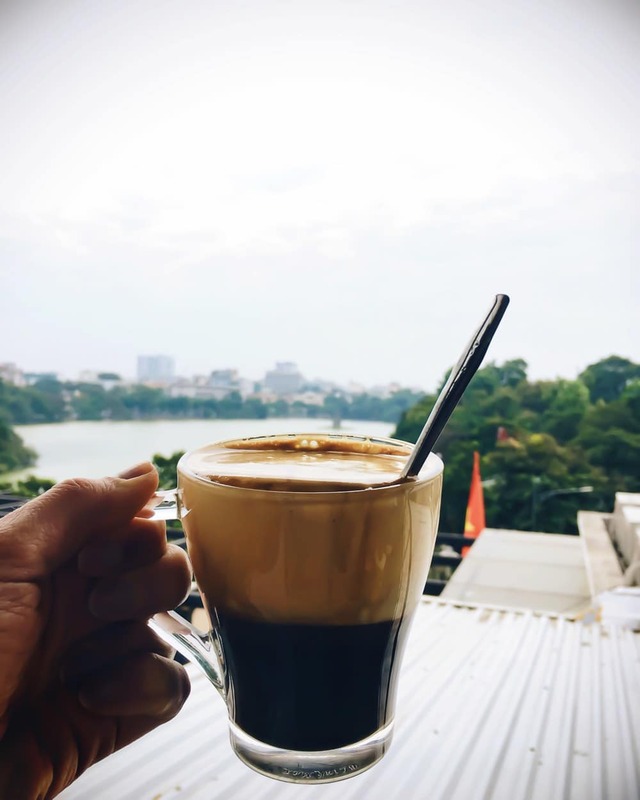 Ngoc Son Temple, located on Hoàn Kiếm Lake in the heart of the city (it’s the body of water you see beyond the cup of coffee in the photo above). Museum of Ethnology. A bit farther afield, but worth the hike. Get caught up in the old city. See if you love the chaos as much as we did. EAT. Anything and everything that looks good. Also referred to as Saigon, Ho Chi Minh City is the capital of the south. We really only had a few hours here (and at this point in the trip had lost our debit card and burned through all of our remaining cash), so I can’t give you the most accurate recap. We did spend time walking around, and I was struck by how new the city felt. The West’s influence and monetary investment was clearly visible in the grandeur of the buildings, the presence of major luxury retailers, and even how the streets were arranged. We did have one of our best meals of the trip in a restaurant here (Hoa Tuc), a spot we picked for its combination of good Trip Advisor reviews and the fact that it took credit cards. Since it was our last night, we ordered with abandon and loved every dish so much, the hassle of losing our debit card felt worth it, because I don’t think we would have chosen the restaurant otherwise. 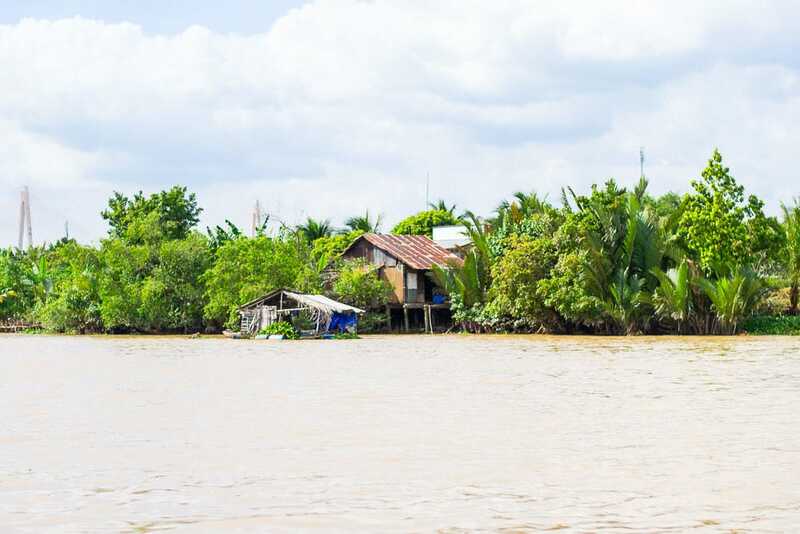 Less than two hours outside of Ho Chi Minh City, you’ll find the Mekong River Delta, and along its shores, small cottage industries operated by a people who have been living in much the same way for hundreds of years. 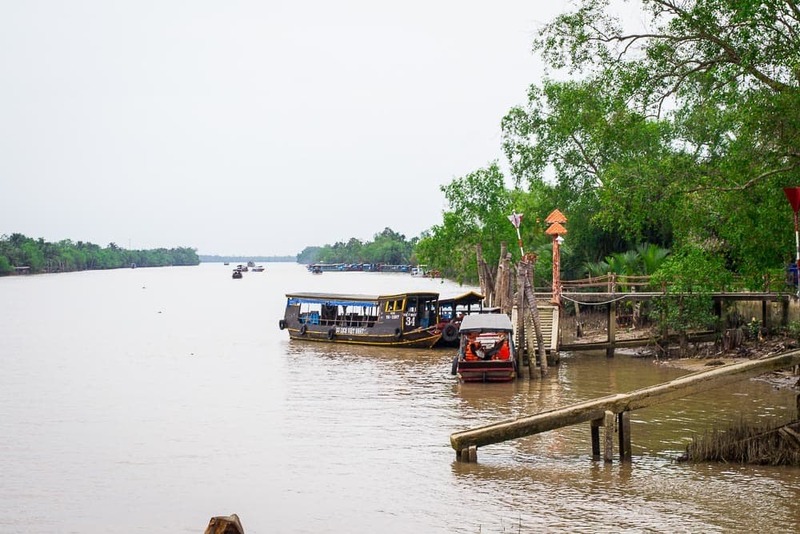 We booked a river boat tour of the Delta via Intrepid Travel (the same company I used to plan our hike through Thailand), and I am incredibly glad we did. This area of Vietnam is tropical and lush. Many of the Delta people are tropical fruit farmers. In addition to the fruits with which you may be familiar like mangos and papaya, we sampled a whole variety of fruits whose names I’d never heard before: custard apples, milk fruit, longan, sopodilla, and jackfruit, the enormous specimen I’m holding in the photo below, as well as the flavor inspiration for Juicy Juice gum. 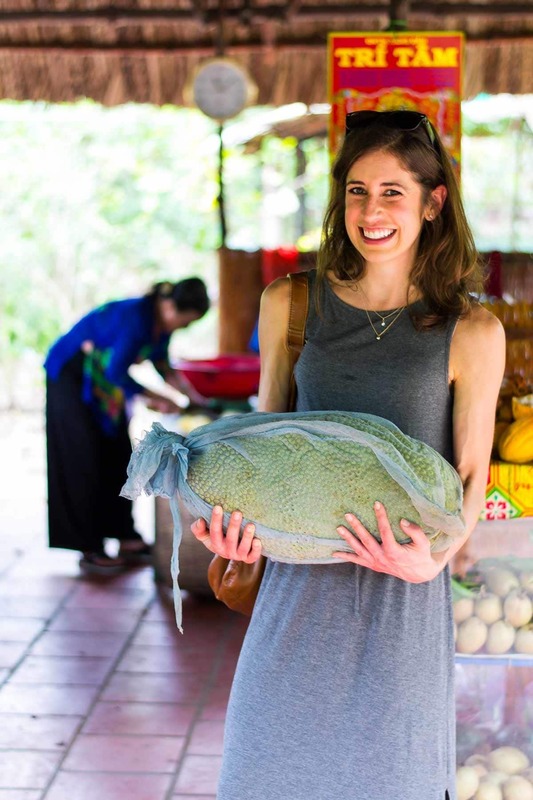 I spent every day we were in south Vietnam attempting to eat my body weight in tropical fruit. I can only imagine that my Vitamin C intake was on point. 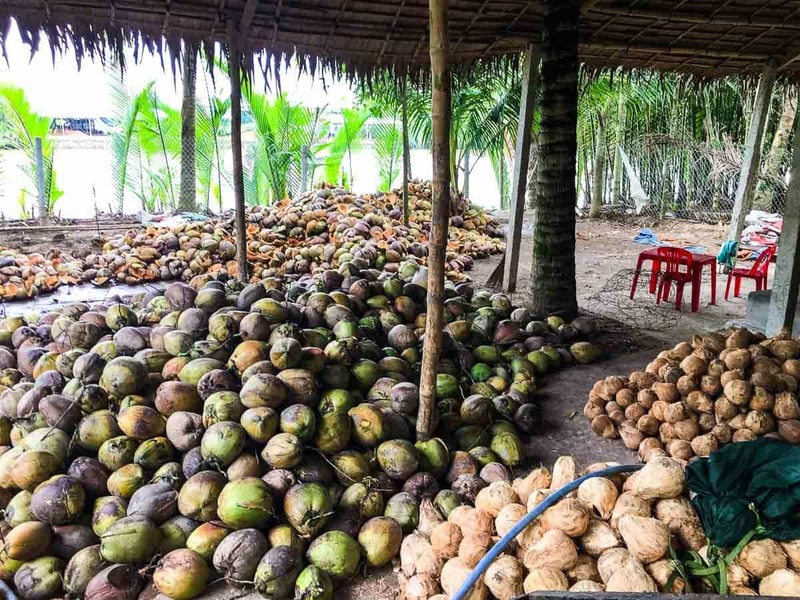 If one fruit could rule them all in the Mekong, it would be the coconut. This area grows and processes thousands of coconuts every day, 365 days a year. Every part of the coconut is used, from the more obvious milk and flesh (cooking and coconut candy making) to the outer fibers (blankets). Most of the processing occurs outside of people’s homes. Villagers work for hours to process the coconuts, which are then picked up by trucks that belong to larger companies. We spent our last night at a peaceful homestay along the river’s edge. I’d booked this dorm-like accommodation thinking that we’d have one final night of disconnection from the outside world. Little did I expect that our little dorm would have the strongest Wi-Fi signal of our entire trip. But I suppose that summarizes our experience in Vietnam: a blend of the old and the new, where a traditional, foreign (to me) culture blurs with familiar trends and innovation. 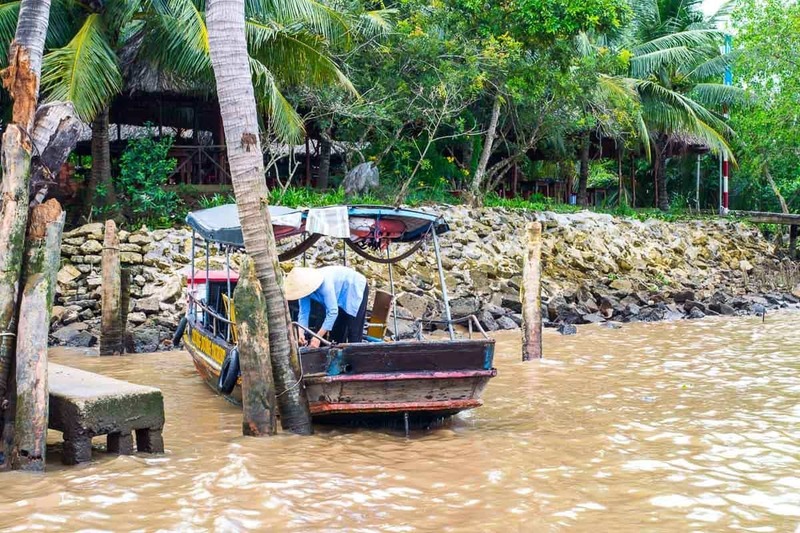 Take Vietnam with a spring roll in one hand, a smart phone in the other, and a heart open to new experiences, and I suspect you’ll fall for this country as hard as we did too. Thank you so much for following along on this adventure with me. It has been a pleasure to share these snapshots of what I know will be one of the most special trips of my lifetime with you. I hope you enjoyed the ride as much as I enjoyed reliving it! I RARELY use this word: awesome pictures! Can you even believe that you were so blessed to be able to take this trip? What a lifetime memory you’ll both always have to share. And so many thanks for sharing it with the rest of us who may or may not ever get the chance to see this part of the world. Hope that you and yours along with your furry friend have a wonderful holiday. Chris, THANK YOU! That means so much. We were truly so blessed. I hope that you had a very happy holiday too! This is on my bucket list! WOW! It is definitely a bucket-list worthy! If you go, I’m sure you would have an amazing time. Thanks for the comment! The snake? 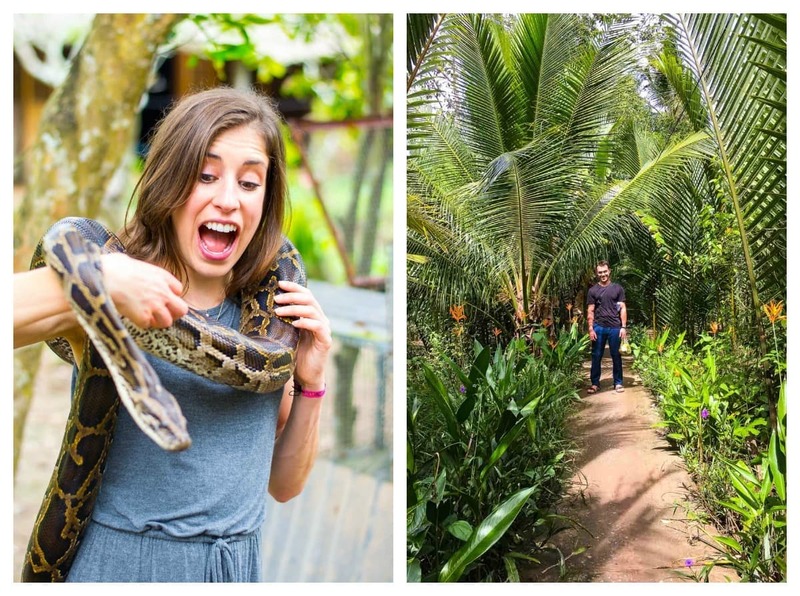 I was all over the photos until I saw the snake and then I was a bit freaked out. However, I prevailed and kept reading. You really do have a gift with your words to make us feel as if we were there with you and tasted what you ate, smelled the smells you experienced and make the trip. You do the same for food, but I can’t help but feel that you could so so much more than make, describe and blog about incredible food. Thanks for letting me experience this through your eyes and your words! Merry Christmas! Hey girl glad ya’ll had a great time! Thank you so much Shawnna!!! So glad that you had wonderful experiences in both Thailand and Vietnam. I recently returned from teaching for two years in Beijing, China. While living in Asia, I had multiple opportunities for travel and truly enjoyed my many trips to both countries (loved Cambodia too!). 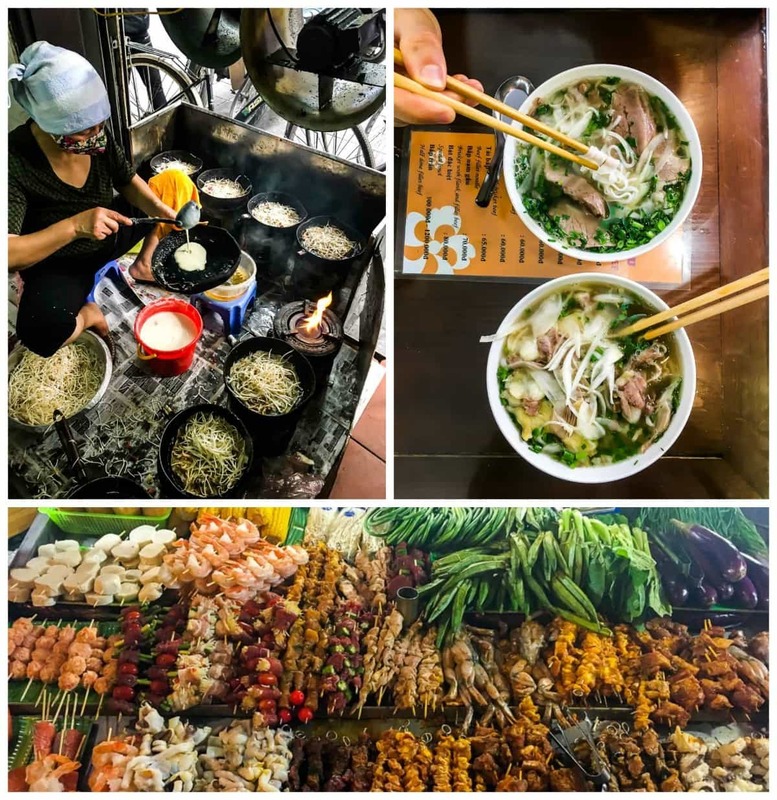 While in Hanoi, I embarked on a highly recommended walking food tour and was delighted with all of the places we visited so perhaps you had a chance to do that as well. And while in Cambodia, I attended a cooking class which was amazing. Now I’m back in Texas and attempting to recreate some of my favorite recipes from my adventures abroad so I’ll look to your website for help! Meanwhile, I hope that you have a chance to enjoy more exciting travels in the new year. Cheers! Thank you so much for this nice note Aimee! Our experience truly was so special. We heard great things about Cambodia too. I already want to go back and add it to our list! I’m not sure I’d trade Thailand for Vietnam, but I definitely understand why you like it so much. As one whose classmates died in the Vietnam war, I was very reluctant to visit initially, but was very pleasantly surprised to see a country whose people are thriving. I love Halong Bay, but am also annoyed by the pollution from China. I’ve been there a couple to times, and the pollution was much worse the second time. There is one other place in the world where you can see similar limestone karsts – it just happens to be near Phuket, and includes James Bond Island. 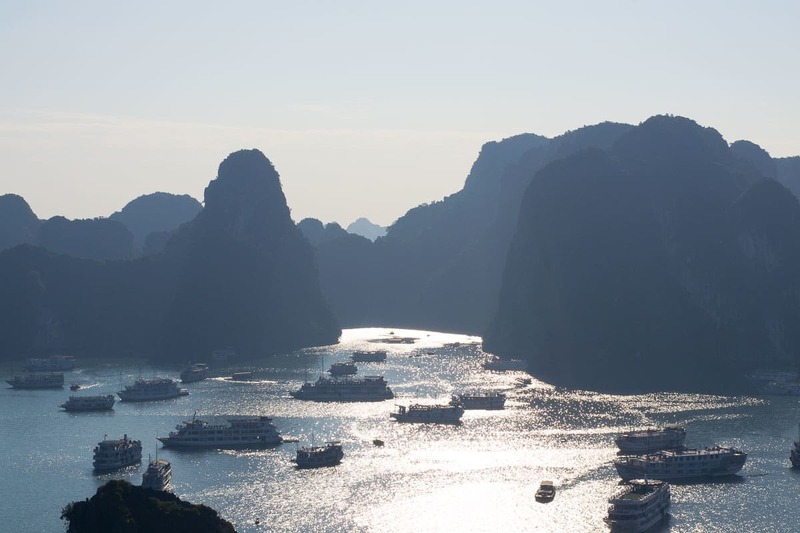 We were there last year, and although it is smaller and less iconic than Halong Bay, it is gorgeous. We have not been to Hanoi yet, but have been to Saigon several times; last year we took a cooking class, and had a wonderful time with it. We went to the Mai Home cooking school, and recommend it. Thank you for sharing your trip with us. I’m glad that you are having the opportunity to travel and get to know the amazing planet we live on. Susan, thank you for sharing your thoughts and memories! I really was bummed not to make it to Phuket (we ran out of time), and now I want to go back :) We didn’t end up trying durian, mostly because I couldn’t get over the smell. Next time!! I love your pictures. These pictures reminded me of my hometown so thank you!! Halong is beautiful, I hope I can visit someday. I heard the food in HaNoi is is pretty awesome. Did you get to try? Thank you so much Amy! It really was so gorgeous there. You must have a beautiful home town :) We ate a ton in Hanoi! 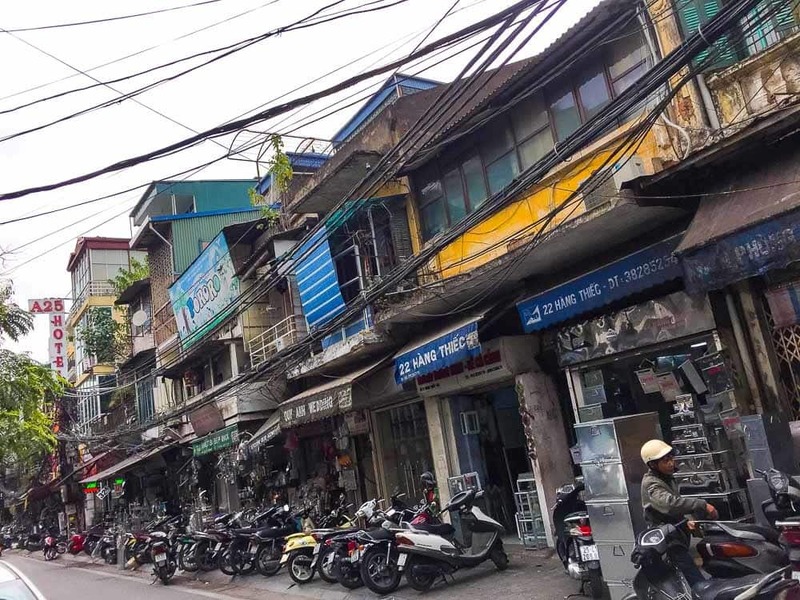 I included some info about what we had in the Hanoi section of the post above if you are interested in reading about it. Erin! Love your posts about Vietnam and Thailand! My bf and I are going to Thailand for a wedding and we’d like to fly into Vietnam or Cambodia first. Do you recommend any websites where we can easily book a flight from Vietnam or Cambodia to Phuket? I normally use Kayak or justfly.com, but I am wondering if you recommend anything else! Also, I assume you flew from Hanoi to Ho Chi Ming? Do you recommend a certain airline? Lastly, did you just tuk tuks to get around or how did you guys get around the cities? Thanks! Becky, you are going to have such an amazing time!! I want to go back with you :) I just used kayak or Google.com/flights to book all of our tickets, and it worked great. In terms of getting around, the big cities actually had uber, so if we didn’t have transport planned through the tour company, that is what we used. Safe travels and have an extra egg coffee in Hanoi for me!